Having just celebrated Independence Day, it might be worth our while to delve into what Alabama’s K-12 students are being taught about United States History and what being a good citizen means. Much has been said about America’s lack of knowledge in Civics, and the Intercollegiate Studies Institute’s report from 2008 highlighting the lack of knowledge was startling. “Without knowledge of your country’s history, key texts and institutions, you don’t have a frame of reference to judge the politics and policies of today,” said Richard Brake, head of the institute’s American Civic Literacy Program. The average score of adults on the Civics Test was a dismal 49%. For more bad news about how little our children know about American history, check out the results of the 2010 U.S. History test conducted by the National Assessment of Education Progress (NAEP). While gains among specific demographic sub-groups was impressive, overall less than 25% of students across the country scored at the “proficient” level on the NAEP. It is worth mentioning that in 2011, the Thomas B. Fordham Institute published “The State of State U.S. History Standards 2011” where Alabama’s course of study earned an A-. We were one of only six states to earn an A-, and only one state—South Carolina—earned an A. The average grade across the states was a D. It should be noted that the Institute reviewed Alabama’s course of study that was adopted in 2004. It is the same course of study that is still in use. Let’s take a moment to delineate how in Alabama a course of study is organized and how it is formed. 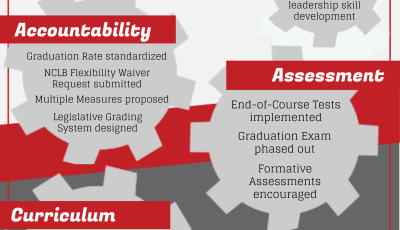 Every few years the standards in each subject area are reviewed at the state level. Click here to download the cycle in Word format, revised in November 2010. Or look below at the image. As you can see, the Social Studies standards were reviewed in 2009-2010 (and can be found here), and the official “adoption” of the standards is scheduled for 2013. 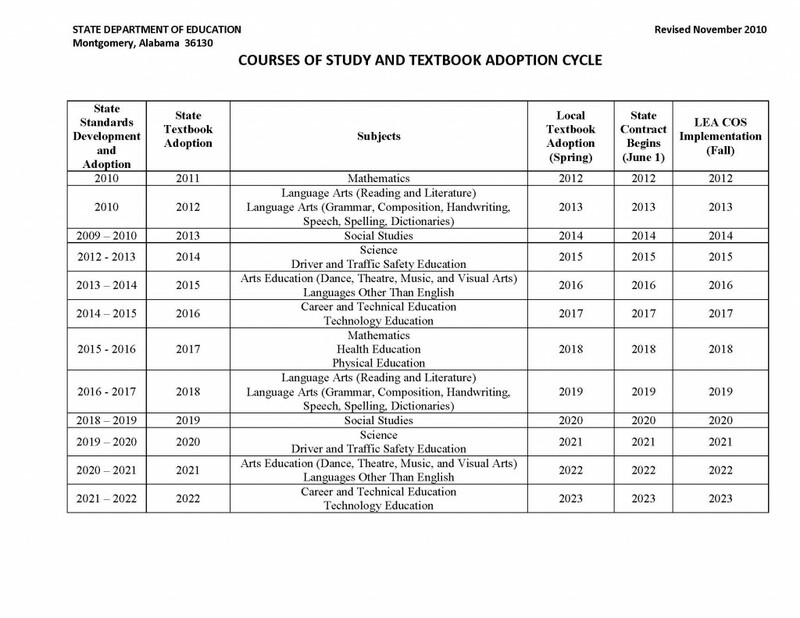 Textbook selection and adoption follows the following year, and the new curriculum, standards, and textbooks will be used for the first time during the 2014-2015 school year. In case you were wondering, the names of persons who served on the committee to review and revise the Social Studies standards in 2009-2010 begins on page v of the document. Again, though, these standards will not be implemented until the 2014-2015 school year and could theoretically be changed before that date. So let’s look at the standards, curriculum, course of study that are currently in place. Clearly, the teaching of these subjects is not confined to these grades. American History and various Civics issues appear throughout the curriculum and content standards. If you click around and scroll, they are easily spotted. For example, you will find “Contemporary Issues” listed as being provided through high school elective courses. In the First Grade content standards, you will find “Discuss civic responsibilities of participating members of a community and state” along with “Identify roles and responsibilities of leaders within the community and state”. The course of study gives a clear picture of what our children are expected to learn in each grade. Some school districts may swap a few things around, but unless they have received permission from the ALSDE (remember, that’s the Alabama State Department of Education) to move subjects from one grade to the other, they should be following the state course of study. I won’t list it all here. Take the time and page through the Course of Study. That’s where you’ll find the details of what is being taught to our children. It is also worth mentioning that Alabama’s was ranked 13th in the nation for overall Standards and Accountability in EdWeek’s 2012 Quality Counts rankings. And when you look just at Standards, Alabama earned a perfect 100. 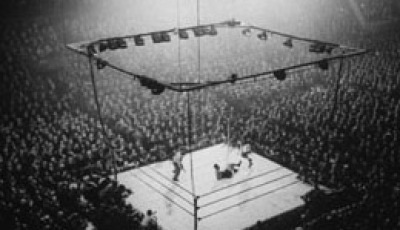 While we’re at it, though, we owe it to ourselves to review Xavier University’s Center for the American Dream’s 2012 results of a study looking at Americans’ knowledge of our government and civic responsibility through administration of the test given to immigrants looking to become naturalized. While native-born citizens do well on basic questions related to history and geography, the results reveal a low level of knowledge concerning the principles and features of American government that underlie our civic life. In fact, in straight rank order, these questions elicited the highest incorrect scores. Standards Are In Place, What About Teaching? So we know Alabama has highly-rated standards in place, but standards just form the basis for what happens in the classroom. It takes teachers to implement the standards through lesson plans and daily classroom efforts. And remember that these standards are a minimum content standard, which means that local school districts are allowed to teach beyond the minimum standards if they so choose. Standards are just pieces of paper. The learning of the standards takes place everyday in Alabama’s classrooms. It is imperative that our children have great teachers to impart the knowledge and engage our children in order for them to learn the material presented to them. 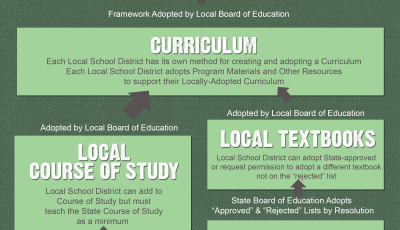 Do you know what your school district’s curriculum looks like? Do you know what your children are going to learn in social studies when the school year starts next month? Hoover City Schools has done an excellent job putting their curriculum plans online. When you click the link, you can click around in any subject area and get a fairly detailed look at the basic expectations of what teachers should cover in the course of a school year. 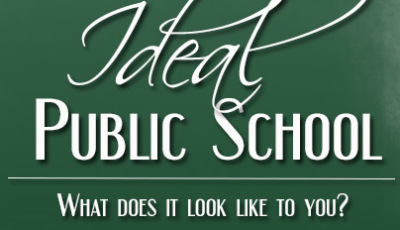 Look through your school district’s web site. If it’s not there, check your local school’s web site. If you can’t find it, ask your child’s teacher or principal. If your school doesn’t have a locally-adopted curriculum, it could be that they strictly follow the state course of study. Engage in Your Child’s Learning! It is important to know what your children are learning when so you can participate in your child’s education. History and civics are subjects in which we can all participate. Ask them what they’re learning, and what they like about it. You will probably learn something, too! When families engage in what children are learning at school, research is clear: students perform better and are more engaged in their own learning.